Many of the people I work with in both taijiquan and counseling have chronic pain. According to the National Health Interview Survey done by the CDC , about 25 million Americans suffer daily pain and about 54 million Americans have chronic pain. In working with pain, I use a combination of movement and mindfulness. Taijiquan and qigong can work wonders for pain relief. Each is a gentle way to get moving again and a way to attain balance in all parts of life. There are several books I suggest to folks. First are the works of Toni Bernhard. You can read more about her at http://tonibernhard.com/. She addresses pain management from a Buddhist perspective. She has written several books on the topic and about her own coping with chronic pain. Another book is “The Pain Antidote: The Proven Program to Help You Stop Suffering from Chronic Pain, Avoid Addiction to Painkillers and Reclaim Your Life”, by Mel Pohl, MD and Katherine Ketcham. You can find out more about it at http://www.thepainantidotebook.com/index.html. Pohl helps people get off opiates and develop alternate and more effective ways of coping with pain. Taiji and qigong work with pain by changing your relationship with gravity, changing the way you breathe, and calming your mind and body. A principle of taiji is that you only expend the energy and engage the muscles for whatever it is you are doing at that moment. Everything else is relaxed but ready. Your joints are never locked. Your spine is upright and your head rests in balance on your shoulders. If you had a plumb bob attached to the center of the top of your head and it ran down the center of your body, that plumb bob would always touch the floor somewhere between your feet as you move. Standing at rest, it would be equidistant between your ankles. Your shoulders are relaxed – neither tucked forward nor pulled back. When you change your relationship with gravity and are balanced, there is less pain because you are not tilted forward or back putting a lot of work on your neck, shoulders, and back. You also carry your body differently according to mood. Being in balance and harmony with gravity can also balance your mood. Breathing to your diaphragm also reduces stress which can reduce pain. There is an emotional component to pain. Calming the emotions can help reduce the pain. Abdominal breathing slows the heartbeat, reduces blood pressure and blood sugar, lowers stress hormones in the blood, changes the blood flow in the body, improves digestion, and even changes your vision. You are going from fight-flee-freeze-faint mode to rest and digest mode. This is a guide to finding balance in a standing meditation. You can read more about the principles of taijiquan and qigong here. You can also change your relationship with pain by changing the emotional relationship with it. Rather than fighting it, have a conversation with it. What is it trying to tell you? How does it feel? Is it hot, cold, throbbing, a dull ache? Notice it, be with it. Change your self talk with pain to change that relationship, too. Pain is not a bad thing, it is there to tell us something is wrong. Sometimes the harder we try to make it go away, the harder it works to be heard. Changing self talk can help with that as well. You change your relationship with pain. Another option is humor. In 1979, Norman Cousins wrote a book called, “Anatomy of an Illness As Perceived by the Patient – Reflections on Healing and Regeneration.” I came across it back when it was published in 1979. My dad was in an intensive care unit for most of two years during that time. Cousins found that a component of his healing was humor and included things like watching Candid Camera and Marx Brothers movies. Laughter changes the hormones in your body and can bring on pain relief. Even just a smile can begin to bring calm and start to lessen pain. When people have found that support groups sometimes unhelpfully come down to contests of who hurts the most, humor can erupt to help with coping, especially in the form of Monty Python. Just the thought of the Yorkshire men can bring on a smile. There is a Zen story of a master who stands with his eyes closed and yet catches a falling object while those wide eyed around him have not yet perceived the object’s fall. He is in the moment and completely attentive. Application of Behavioral Medicine, recently talked about how to rewire your brain to improve willpower. A March 23, 2015 article in Medscape discussed a study in Sydney, Australia that looked at nine modifiable triggers for low back pain. The leading trigger is distraction while performing a task or activity. What do willpower and distraction have in common? Both are associated with losing focus. How can we practice focus and get better at it? Buczynski suggests a simple breathing exercise for five minutes a day. Simple does not mean easy, however. Many people give up mindfulness or meditation because of a racing mind. Buczynski recommends just focusing on your breath, and when thoughts come into your mind (as they inevitably will) just acknowledge them and return to breathing. You can focus on the sound of the air as it flows in and out or the temperature of the air or whatever works for you. The important thing is, return to focusing on the breath. It gives you practice for staying on task, and returning to the task when you wander. Any time I work with someone who has issues with anxiety and stress, we start with the breath. Slowing your breathing and breathing abdominally does many good things for you – lowers blood pressure and heart rate, lowers stress hormones and in doing so lowers blood sugar and redirects blood flow to the organs. You are balancing your sympathetic and parasympathetic nervous systems. So if you want to feel better and more balanced mentally, emotionally, and physically, start just focusing on breathing to your abdomen slowly and mindfully. You will improve your willpower and your focus. Paying attention to where you are now can also save your back. Paul Assaiante is the winningest coach you probably never heard of. His squash teams at Trinity College won 224 straight and 282 out of 292 matches during a sixteen year stretch. Squash doesn’t play well on television and is most popular in former British colonies post 1776. Consequently, he is not well known in America despite his success. He recently wrote a book on coaching to overcome fear called Run To the Roar. His story begins with a tale of a lion pride on the African savanna. The oldest lioness is no longer able to run fast and hunt like the younger members. What she can still do is roar. When the pride hunts, the young lions spot a heard of prey and stealthily move in the bush to the far side of the hunted. The old lion stays on the near side and when all is ready, lets out a ferocious roar. The prey, reacting to the perceived threat, run from the roar and right into the teeth of the waiting pride. Coach Assaiante helps his athletes face their fears and move towards them. Running away never gives them a chance to cope with their fears and anxieties. Pema Chodron addresses this in The Places That Scare You: A Guide to Fearlessness in Difficult Times. She teaches mind training in Buddhist tradition to help one cope and learn from that which we fear. We pay attention, we do not avoid life as it is, but embrace it with loving kindness. We listen to the stories we tell our selves, and we re-write those stories. She calls it training in the warrior’s journey. We are all embarking on, as Joesph Campbell wrote, a hero’s journey in this life. Our fears and anxieties and our failures are also our teachers. Our brain’s have remarkable plasticity and ability to change over our lifetimes. Our minds can grow and we can re-write our stories. Listen to the phrases you say to yourself. How are those beliefs and stories affecting your life? What we tell ourselves, we become. Many of the people I see have problems with anxiety and stress. There is always stress in one’s life. What matters is how we frame it and how we manage it. We frame it with our life narrative, our central organizing principal. Those are the words you say to yourself as you live your life. It may be something like, “no matter what happens, I will always land on my feet” and you take a problem solving approach an d see stress as opportunity for growth. On the other hand, the mantra may be “I am always a failure and everybody can see that.” The lack of self efficacy and self confidence can really raise one’s anxiety level. When we perceive something as threatening, the amygdala springs into action sending messages to get stress hormones moving to get us ready to fight or flee. We may be overwhelmed and freeze or even faint. The emotion hits first milliseconds before we are able to think. There are a couple of techniques to practice to help cope with that rush, and to help you move towards another possible reaction to stress – flow. Flow is more akin to the reaction that the person who sees a crisis as an opportunity for growth and who actively problem solves will use. Some of these techniques involve breathing and grounding. You can practice by getting relaxed in a chair sitting so that your body parts have good blood circulations and don’t “fall asleep.” Close your eyes and breathe in through your nose and out through your mouth. Breathe to your diaphragm. Place one hand on your upper chest and one on your stomach. When you breathe, only the hand on your stomach should move. Breathe slowly – count to four as you breathe in, hold it for a count of four, breathe out for a count of four. Practice the breathing technique several times a day. You can pair a word with the exercise, something as simple as “serenity” or “relax” so that eventually you can just say the word to yourself and the relaxation begins. 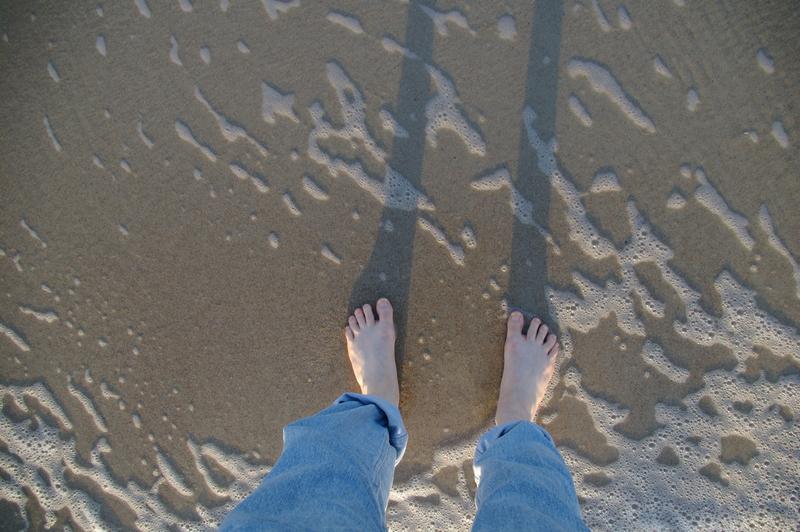 Grounding is the process of getting yourself into the present moment – “be here now.” Feel your feet on the floor, the way your clothes feel upon your skin, notice the colors of your environment, the shapes, the sounds, the smells, etc. Focus on the surroundings to take yourself out of that vision of stress and into the present. We will look at other techniques in later entries, but breathing is a good place to start and is fundamental. When you slow your breathing down, it slows your heart rate, lowers your blood pressure, and reduces the stress you feel. Then you can approach whatever the issue is with a clear mind.